EMAIL US Robert LE GROSVENOR was born about 1150 in England. He died in 1200 in England. Children were: Randle LE GROSVENOR. Children were: Joan PULFORD . Joan Leake died in 1488 in England. She was buried in M.I. Holbeach Church. Parents: Sir Richard Leake. Children were: Joan Leake . Hannah Learned was born on 24 Aug 1649 in Woburn, Massachusetts. She died after 1722. Parents: Isaac LEARNED and Mary Stearns. She was married to Joseph Farwell Ensign on 25 Dec 1666 in Chelmsford, Massachusetts. Children were: Henry FARWELL Capt., Joseph Farwell. Isaac LEARNED was born before 1623 in England. He was baptized on 25 Feb 1623 in Bermondsey, England. He died on 29 Nov 1657 in Chelmsford, Massachusetts. He resided at in Chelmsford, Massachusetts. Isaac lived in Woburn after his marriage, but moved to Chelmsford in 1652. He served on the selectboard in Chelmsford. Parents: William LEARNED and Judith. He was married to Mary Stearns on 9 Jul 1646. Children were: Hannah Learned. William LEARNED died on 1 Mar 1646 in Woburn, Massachusetts. He was born in England. William Learned of Bermondsey, County Surrey, England settled at Charlestown, Massachusetts. He was made a freeman of the colony on May 14, 1634. On april 26, 1638 he was chosen one of a committee of six who "were desired to consider of some things tending toward a body of lawes." December 18, 1640 he signed at Charlestown the "Town Orders for Woburn," and was one of the first seven members of the church in Woburn, gathered August 14, 1642. He was one of the first board of selectmen chosen April 13, 1643, and again February 9, 1644-5. At the same time he was elected constable (also tax collector), and remained in office until his death. Mary-Lee Ledger. Parents: Mr. Ledger and Ruth Quimby. He was married to Ruth Quimby. Children were: Wayne Ledger, Mary-Lee Ledger. Wayne Ledger Parents: Mr. Ledger and Ruth Quimby. She was married to Keith R. PITKIN in 1933. She was married to William PITKIN in 1844 in Iowa. Children were: Mary Jane PITKIN, William E. PITKIN, Arthur PITKIN, Franklin PITKIN. Tryphosa Lee was born in 1597 in Great Yarmouth, Norfolk, England. She was married to Stephen Tracy on 2 Jan 1620 in Leyden, Holland. Children were: Sarah Tracy. Robert James Leggett was born on 18 Feb 1932. He died on 6 Jun 1990. He was married to Leslie PITKIN on 9 Jan 1971. Aldo Carl Leopold Son of Aldo Rand Leopold and Estelle Bergere. He was married to Lynn BRADLEY. "Dr. Nina Leopold Bradley, eldest daughter of Aldo Leopold, has undertaken ecological research throughout her life, established two family planning clinics (Columbia, Missouri and Bozeman, Montana), and currently lectures widely on Leopold and the land ethic. Nina and her husband Charles have directed research and ecological restoration at the Leopold Memorial Reserve since 1978. She received an honorary doctorate degree in environmental sciences from the University of Wisconsin in 1988 and has received many awards, including The Wilderness Society's Bob Marshall Award in 1995." She was married to Charles Crane BRADLEY. Charles Lewis III was born on 7 Jul 1918. Son of Charles Lewis, Jr. and Beatrix Johnson. He was married to Natalie Vanderbilt Norton . Children were: Diane Vanderbilt Lewis, Judith Anne Lewis, Charles Richard Lewis. Charles Richard Lewis was born on 23 Apr 1948. Parents: Charles Lewis III and Natalie Vanderbilt Norton . Diane Vanderbilt Lewis was born on 14 Feb 1941. Parents: Charles Lewis III and Natalie Vanderbilt Norton . She was married to James H. Gately. Children were: Christopher Gately, Thomas Charles Gately. Esther Lewis was born on 22 May 1741 in Lyme, CT. She died on 17 Mar 1802 in Lemster, NH. She was married to John Miller Tubbs in 1769 in New London, CT. Children were: William Tubbs . Judith Anne Lewis was born on 11 Apr 1947. Parents: Charles Lewis III and Natalie Vanderbilt Norton. She was married to Henry Kenney. Children were: Mehitabel Kenney. Aaron Lilley was born in May 1795. He died on 4 Dec 1869. He was buried in East Calais Cemetery. He was married to Celinda Bliss after 1859. Agnes LINGWOOD was christened on 29 Jan 1562 in Bolking, Essex, England. She was born in 1564/65 in Of Bocking, Essex, England. She died on 14 Apr 1619 in Essex, England. Parents: John LINGWOOD and Jane MARLAR. She was married to John LOOMIS (LUMMYS) on 30 Jun 1589 in Essex, England. Children were: Joseph LOOMIS, Ann LOOMIS, Sarah LOOMIS, Elizabeth LOOMIS, Geoffrey LOOMIS, Jane LOOMIS, Godfrey LOAMIS. Alice LINGWOOD was born in 1567 in Braintree, Essex, England. Parents: John LINGWOOD and Jane MARLAR. Geoffrey LINGWOOD was born in 1562 in Braintree, Essex, England. Parents: John LINGWOOD and Jane MARLAR. John LINGWOOD was born in 1546 in Braintree, Essex, England. Birthdate is inconsistent with that of his wife and children, although it is consistent with that of his parents. -CP He died in 1592 in Kelvedon, Essex, England. He was buried in 1592. He was christened in Braintree, Essex, England. Parents: William LINGWOOD and Mary WILSON. He was married to Jane MARLAR in Of Essex Co., England. Children were: Mr LINGWOOD, Son LINGWOOD , Miss LINGWOOD, Geoffrey LINGWOOD, John LINGWOOD, Agnes LINGWOOD, Alice LINGWOOD, Susan LINGWOOD, Sara LINGWOOD. John LINGWOOD was born in 1563 in Braintree, Essex, England. Parents: John LINGWOOD and Jane MARLAR. Miss LINGWOOD was born about 1561 in Braintree, Essex, England. Parents: John LINGWOOD and Jane MARLAR. Mr LINGWOOD was born about 1558 in Braintree, Essex, England. Parents: John LINGWOOD and Jane MARLAR. Sara LINGWOOD was born about 1569 in Braintree, Essex, England. Parents: John LINGWOOD and Jane MARLAR. Son LINGWOOD was born about 1560 in Braintree, Essex, England. Parents: John LINGWOOD and Jane MARLAR. Susan LINGWOOD was born in 1569 in Braintree, Essex, England. Parents: John LINGWOOD and Jane MARLAR. William LINGWOOD was born about 1520 in Braintree, Essex, England. Melinda Linton was born on 30 Apr 1832 in Stanstead, Quebec. She died on 16 Jun 1921 in Marshfield, Vermont. Melinda was the daughter of George Linton and Patience Folsom. She was married to Samuel BEMIS twin on 18 May 1853 in Marshfield, Vermont. Children were: twin boy BEMIS, Phineas G. BEMIS. Ebenezer Little was born in 1762. He died in 1833. Ebenezer and Jane Little moved to Waterloo, Illinois in 1798. Parents: Moses Little and Mary Milk. He was married to Jane (Jenny) Burbeck on 5 Aug 1783 in Newburyport, Massachusetts. Children were: Jerusha LITTLE. Ebenezer Little was born in 1715. He died in 1768. Parents: Moses LITTLE and Mary HALE. Jerusha LITTLE was born on 22 Apr 1799 in Compton, New Hampshire. 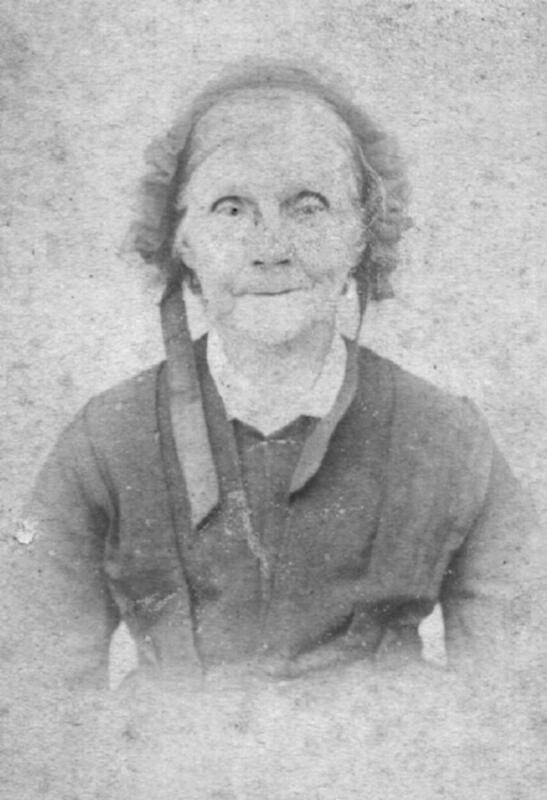 She died on 17 Dec 1873 in Morgan, Vermont. Parents: Ebenezer Little and Jane (Jenny) Burbeck. She was married to Charles Cummings on 28 Feb 1826 in Compton, New Hampshire. Children were: George Perkins CUMMINGS, Jane Milk CUMMINGS, Rockwood CUMMINGS, Alice CUMMINGS, Jotham CUMMINGS, Charles Colby CUMMINGS. Joseph Little was born in 1653. He died on 27 Jan 1737. Parents: George LITTLE and Alice Poor. He was married to Mary COFFIN on 31 Oct 1677. Children were: Moses LITTLE. Moses Little was born in 1739. He died in 1798. Moses resided in Newbury, Massachusetts prior to his marriage. Parents: Ebenezer Little and Elizabeth Brown. He was married to Mary Milk on 9 Jul 1757 in Falmouth (Portland), Maine. Children were: Ebenezer Little. Moses LITTLE was born on 5 May 1690. He died on 15 Aug 1725. Parents: Joseph Little and Mary COFFIN. He was married to Mary HALE on 5 Jan 1714. Children were: Ebenezer Little. He was married to Ola Charlotte Cruickshank on 30 Aug 1941. Abigail LIVERMORE was born on 9 Oct 1683 in Watertown, Middlesex, Massachusetts. She died on 12 Jul 1710. Parents: Samuel LIVERMORE and Anna (Hannah) BRIDGE. Adan LIVERMORE was christened on 4 Jan 1645 in Watertown, Middlesex, Massachusetts. Parents: John LIVERMORE and Grace SHERMAN. Anna LIVERMORE was born about 1680 in Watertown, Massachusetts. This birthdate seems a bit early. Anna would have been 54 years old at the birth of her last child if this date is correct. Parents: Samuel LIVERMORE and Anna (Hannah) BRIDGE. She was married to John Bemis Jr. on 2 Apr 1713. Children were: Anna BEMIS, Josiah BEMIS, Abraham BEMIS, Grace BEMIS, Lydia BEMIS, Abijah BEMIS, Elisha BEMIS, Elizabeth BEMIS, Nathaniel BEMIS, Susannah BEMIS, Phineas BEMIS. Anne LIVERMORE was christened on 4 Nov 1599 in Suffolk Co., England. She was buried on 20 Apr 1602. Parents: Peter LIVERMORE and Marabella WYSBYCH. Daniel LIVERMORE was born on 3 Feb 1674 in Watertown, Middlesex, Massachusetts. He died on 16 Nov 1720. Parents: Samuel LIVERMORE and Anna (Hannah) BRIDGE. Daniel LIVERMORE was born on 7 Oct 1643 in New Haven, Connecticut. He was christened on 7 Oct 1643 in Watertown, Middlesex, Massachusetts. He died in 1680. Parents: John LIVERMORE and Grace SHERMAN. Edmund LIVERMORE was buried in 1659 in Watertown, Norfolk, Massachusetts. He was born on 18 Mar 1659 in Watertown, Suffolk, Massachusetts. He was christened on 18 Mar 1659. He died on 24 May 1659 in Watertown, Norfolk, Massachusetts. Parents: John LIVERMORE and Grace SHERMAN.